The Cleveland Indians named first baseman Bobby Bradley and right-handed pitcher Mike Clevinger their top organizational position player and pitcher, respectively, for 2015. 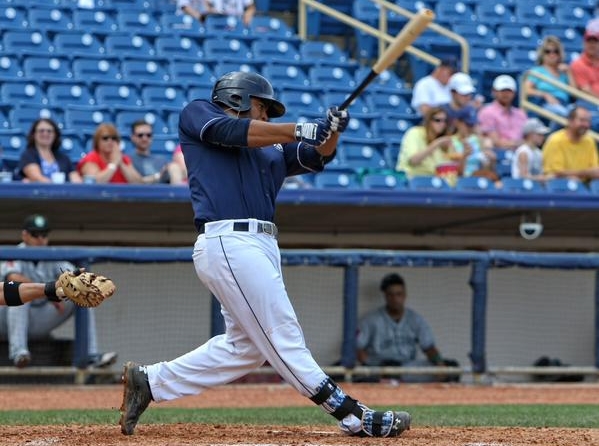 Bradley spent the majority of the season in the Midwest League, batting .269 with 27 HR and 92 RBI in 108 games with the Lake County Captains. (He led the league in home runs and runs batted in.) He was the MWL player of the month in August, when he batted .337 with 11 HR and 38 RBI in 29 games, and was the MWL offensive player of the week three times, for the periods of June 8-14, July 27-August 2, and August 10-16. Clevinger made eight starts for the 2012 Cedar Rapids Kernels, going 1-1 with a 3.73 ERA, 34 strikeouts and 13 walks in 41 innings. He made five starts for the 2014 Burlington Bees, going 3-0 with a 1.88 ERA, 27 strikeouts and five walks in 24 innings. This entry was posted in Akron Aeros, Burlington Bees, Cedar Rapids Kernels, Eastern League, Lake County Captains, Midwest League. Bookmark the permalink.